A while back, I reviewed Ayakashi: Classic Japanese Horror Tales. I mentioned that my favorite tale out of the three in the series was Bake Neko which featured a Medicine Seller as the main character. Well guess who ended up with their own series after that? 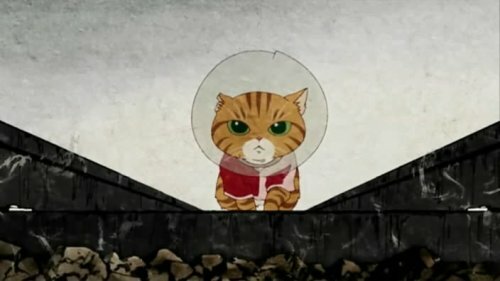 Mononoke is a 12 episode Mystery/Horror series based on it’s predecessor Bake Neko from Ayakashi in 2006. Kenji Nakamura and Toei Animation return to helm this series and it aired during the Summer of 2007. A manga spin off was also released that same summer and was published by Square Enix. Sadly, as of this review, Mononoke has yet to be licensed and is not available for legal streaming. 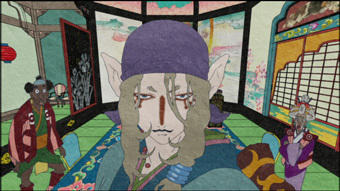 Mononoke follows a wandering, nameless character known only as the Medicine Seller. 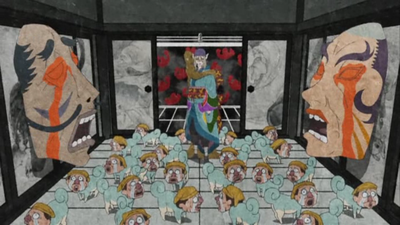 The series is made up of individual chapters in which the medicine seller encounters, combats and subsequently destroys mononoke. The "mononoke" are a type of ayakashi, unnatural spirits that linger in the human world. The Medicine Seller always proceeds in the same manner, using his knowledge of the supernatural to fend off the mononoke until he can learn the spirit's form (Katachi), truth (Makoto) and regret (Kotowari). Only then can he unsheathe his sword and exorcise the demon. The art style of Mononoke is the same as it was during Ayakashi, which is wonderful to see! It’s one of the most unique art styles I’ve seen in any anime series, and it’s certainly one of my favorites along with another series I reviewed last year, Kaiba. It blends this colorful and beautiful art with jarring and sometimes uncomfortable moments that seem like little snapshots that will burn into your memory. This is very effective at times when the Truth is revealed or the will of a character makes time almost stand still for a moment. As for the soundtrack, it’s, again, similar to Bake Neko which is, again, rather nice. The opening and ending themes, were also a nice touch. Especially the opening theme because, for some reason, it sounded like the song came from Italy or France with the way it sounded. It’s one of those rare things I can’t help but enjoy, similar to the use of bagpipes in Last Exile’s opening. The series is broken up into several story arcs with the same overall plot: Medicine Seller shows up some where, some thing supernatural starts happening, Medicine Seller finds a way to save the day by any means necessary. It’s kind of like a monster of the week sort of deal you typically see in some Shonen or Kids shows, but in a different form. Aside from the horror aspect, this show is also different because in some of the stories there is no happy ending. Out of the five arcs in this series, only two have a moderately good ending. The others have more of a solemn, darker ending to give some of the arcs a more tragic feel overall. Each story is different and each results in either a tragedy or a drama depending on how you look at it. Personally, I have two favorite arcs in this series: Noppera-bo (episodes 6 & 7) and Nue (episodes 8 & 9). Both are not only very well animated, but have the most tragic, yet satisfying endings. The rest of the arcs are also well done, but Noppera-bo and Nue are the two that stand out to me the most. There’s not really a lot to talk about character wise since the only person who stays throughout the entire show is the Medicine Seller. We know nothing about his life or his being, in a sense, because of the large time skip we witness between the final two arcs. Since we know nothing about him, there is a sort of disconnect between the viewer and this character, making it a bit difficult to latch onto him. To be honest, that’s really the only big draw back to this series that I can even think of. In any medium, whether it’s books, film, or TV shows, people want to connect with the main character. However if we know nothing about him it makes it almost impossible! Another near example of this is Ginko from Mushi-Shi. You learn almost nothing about him for most of the series except for an episode part way through. But at least you learned about his past and are able to relate to him a bit better. With the Medicine Seller, there is nothing. There is a plus side to this decision, however. That is in the other various characters throughout the entire series. You hear their stories and their ordeals making it easier to connect with one of these characters rather than the mysterious Medicine Seller. As irritating that is for me, it’s a very intelligent move on the part of the producers and the director because the focus is on the stories of these individuals and what brought them to this point. The voice acting is rather interesting to talk about, not because of voice actors or anything like that, but for execution of the dialogue and voice acting. There are some characters that are a bit more bombastic and way over the top than our main protagonist the Medicine Seller. As crazy as it may drive some people to constantly hear the campy acting for Mononoke, those characters that use the over the top lines actually, in my opinion, show a sense naivety in there personalities. This can most effectively be seen in some of the characters who don’t believe in Mononoke or Ayakashi. This is also a really nice counter balance to the Medicine Seller, as he is the more solemn and serious character who accepts anything and everything and knows what he’s doing. Speaking of the Medicine Seller, I really did enjoy Takahiro Sakurai’s performance. Compared to Andrew Francis’s work when he played the role in Ayakashi, it is a really nice blend of knowledge, understanding, and even a tiny bit of curiosity at times. There aren’t really many stand outs else where, but I would like to point out one thing. 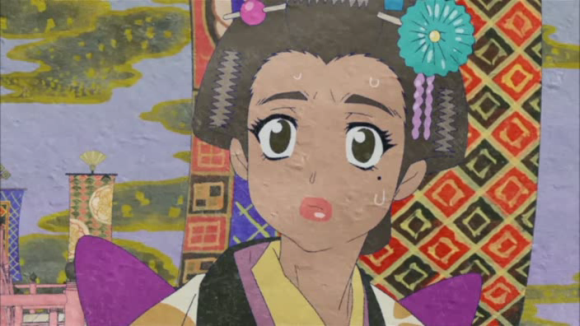 During the second arc, Umibozu, we do get a lovely call back to the original Bake Neko story, not only in the form of rumors but in a character from that story. 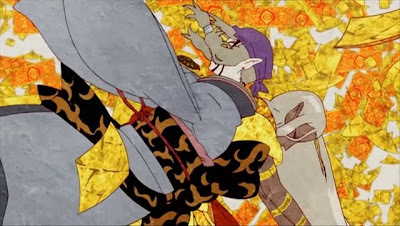 By the end of the exorcism, Mononoke is one of those series that I really wish would come to the states. The art style and stories, like Kaiba, are so unique and compelling that you can’t help but love it. Sadly, also like Kaiba, it will never see the light of day which is extremely depressing. If there is a slim chance that it gets a US release, watch this series. If there isn’t, I’ll leave you to your own devices on how to see it because it is a must see. Final Rating- 9/10 Very unique, very compelling, and very unavailable to watch. Next time, we take on one of the biggest franchises in history.... Or at least a stand alone series. Until then, otaku on my friends! Special thanks to Bukkit Banter cohost MexicanAnime for the request!